Jack Springs leaves home and places himself at the mercy of the elements. Author Jay Lillie has had this thriller in his back pocket for 40 years when a person he knew left loved ones on pretense for a weekend in Vegas. He got caught when he cashed a check out there. Lookout, Jack, your penalty is harsher. Springs, who we find on his own in the middle of a bad storm on board a sailboat he has no ability to handle, must figure out a way to return to his family, continue building his career and relive his normal life. Living in the environments Jay Lillie writes about is what makes his novels, short and long, so interesting and readable. Jay has sailed and raced sailboats most of his life, and he knows a bit about commuting to work in Manhattan where he’s practiced international law for years. 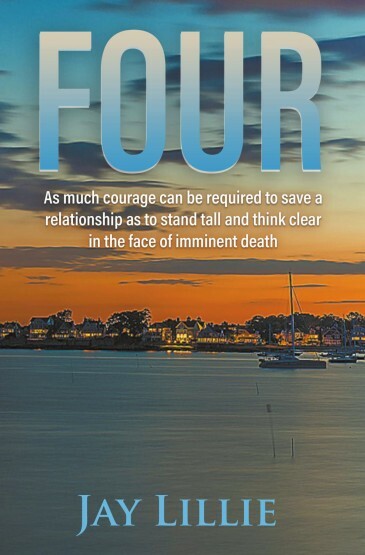 Find Jay Lillie’s “Four” and his other books at selected online book retailers. Book copies are available at LitFire Publishing, Barnes & Noble, and other online book retailers.